December 15, 2013 Archives - Clarksville Sports Network - Clarksville Tennessee's most trusted source for sports, including Austin Peay State University. Nashville, TN – Late in the fourth quarter, the Tennessee Titans (5-9) were down 34-17 to the Arizona Cardinals (9-5) when they scored 17 straight points in the final 3:12 to force overtime. The Titans tied the game when quarterback Ryan Fitzpatrick connected with Michael Preston for an 8 yard touchdown pass with 0:14 second left to play. In overtime, Tennessee won the toss. On the third play of the drive, Fitzpatrick’s pass to Preston was intercepted by Antoine Cason at the Arizona 30 and run back 16 yards. 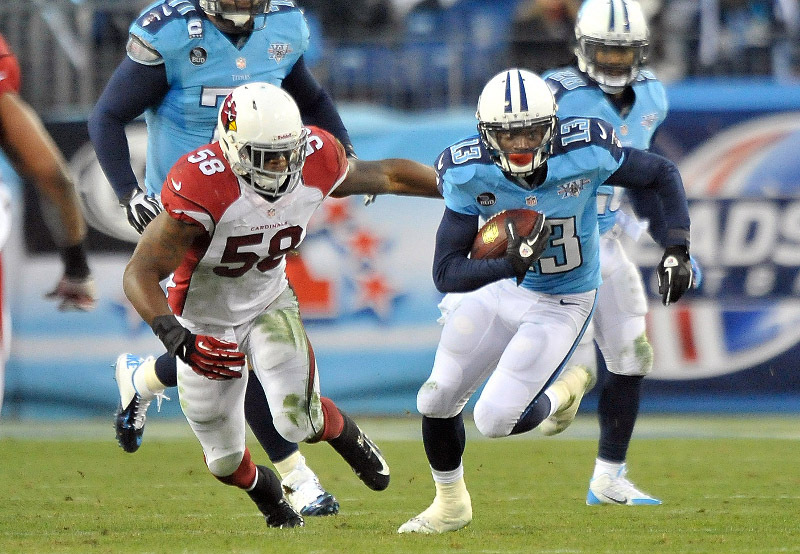 The Cardinals used a heavy dose of runningback Rashard Mendenhall to move the ball to the Titans 23 yard line. From there, Jay Feely kicked a 41 yard field goal to give Arizona a 37-34 victory. Nashville, TN – The combination of a long layoff followed by a long road trip seemed to take a toll on the Vanderbilt women’s basketball team on Sunday. But the Commodores broke out of the funk just when it mattered most. Finishing the game with an 18-9 run, Vanderbilt earned a hard-fought 65-56 road victory over Hartford at the Chase Arena in Hartford, Conn., to extend their winning streak to five games. Knoxville, TN – Third-year Tennessee basketball coach Cuonzo Martin was recently announced as a 2014 metro-east inductee to the Illinois Basketball Coaches Hall of Fame. The induction ceremony is set for April 26th at the Illinois State University Student Union ballroom in Normal, Ill.
Martin enjoyed an outstanding prep career at Lincoln High School in East St. Louis, Ill., and is being inducted alongside former Lincoln teammate and fellow All-State selection LaPhonso Ellis. Jacksonville, Ala – In dominating fashion, the Lipscomb women’s basketball team looked sharp from the start en route to an 86-76 win over Jacksonville State Tuesday night at Pete Mathews Coliseum.